A few years ago I purchased an AtGames Sega Genesis Arcade Motion from a thrift store and wasn’t too surprised by the product’s quality. Sure, it functioned as a nice little plug n play that allowed me to play nearly any Genesis game I wanted from an SD card, but the whole thing felt more like just another cheap Nintendo Wii knockoff gimmick. 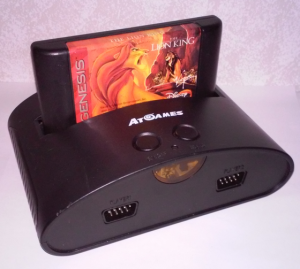 A few short years later AtGames tried to rectify this situation by offering up the Sega Genesis Classic Game Console. 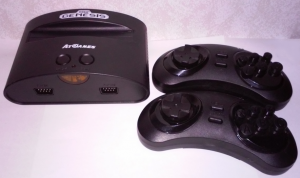 Given their reputation, as well as my experience with their products, will this little Sega Genesis clone fare any better? In true AtGames fashion the Sega Genesis Classic Console has been produced in a handful of different bundles. Mine just so happens to have wireless controllers, while others had wired controllers. Built into the system are also a total of 80 games, half of which were Sega Genesis games and the other half being, yet again, more worthless games tossed in that nobody really asked for. The built in Sega games are fairly good titles, nothing spectacular but it’s nice to have them all accessible with booting up the console, rather than trying to track down my own cartridge. And, obviously, the other built in games are some of the worst quality junk you’ll ever suffer through, so it goes without saying that this system could have benefited by foregoing these and just being a straight Sega Genesis clone. Externally the first thing anyone will notice about the console is just how small it is, even smaller than the Majesco Sega Genesis 3. 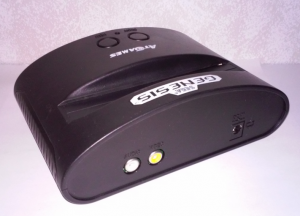 One giant leap forward for the Sega Genesis Classic is, unlike the Arcade Motion, this one actually has a cartridge slot on the top so that you can supply your own games. Up front you have your IR receiver for the wireless controllers, but also given the option to plug in your own wired Sega controllers. Around the back the console is limited to composite AV with mono sound, much like a real Genesis. One thing I found very useful is that, for powering the console, you can use a Sega Genesis MK-1602 power supply on this thing. The Sega Genesis Classic has a few things that surprised me, the first thing was just how well the wireless controllers worked. No, they’re not perfect, but they do work quite well. Another big surprise was that this is completely region free, meaning you can import games from any region and play them on this console. I’ve had a PAL region Mega Drive cartridge for a few years and the AtGames Sega Genesis Classic plays it just fine. This little thing booted up almost every cartridge I threw at it, almost. It’s a well known drawback with SOAC clones that not every game is going to be compatible. I was well aware that the console wouldn’t play games such as Virtua Racing or utilize the Game Genie, but what I didn’t understand was why it wouldn’t run my copy of NBA Jam TE. I cleaned it, tested it on my real Genesis consoles and everything was fine, but for some reason the Sega Genesis Classic wouldn’t run it at all. Sound is also a well known issue with these styles of clone systems, and the AtGame Sega Genesis Classic isn’t any different. Most notably while playing the built in games the sound is horrible, but things seem to be reasonably more bearable while playing games through the cartridge slot. I said bearable, not 100% accurate and true, simply bearable. If you’re in the market for a good Sega Genesis there is absolutely no replacement for the original, or the model 2. 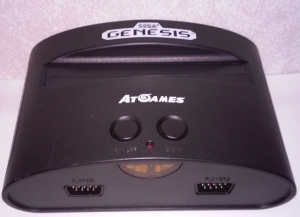 The AtGames Sega Genesis Classic console would be perfect for someone who may not have a large amount of space to keep a collection, not to forget it’s region free as well, or someone who just wants the novelty to pick up and have short bursts of Genesis fun. I can’t say it’s all bad, because I quite enjoy mine to be completely honest, but it’s not exactly perfect. True Sega Genesis consoles are still cheap enough these days that I would highly advise that over this one. My son got the newest Sega Genesis classic from AtGames for Christmas and I just got him NBA Jam T.E. I am also unable to get it to work. Did you find a way to get it to work? Sadly I have not found a way to play it on the console, but if in the future I find a way I will add that information.